Let's take some time today to reflect on the beauty of the Iris flowers. This flower is aptly named from the Greek word Iris, meaning Rainbow, which is fitting when you think about how many colours they come in. A bright and attractive flower, the Iris plant is a world wide favorite, so much so that Japan named May the 8th as Iris Day. Iris Day is also a big event in Brussels, with there being many free concerts and activities happening around the city to celebrate this day. The Iris flowers are commonly found in Northern Temperate Zones, including Europe, Middle East and North America. The fresh, iridescent blooms of the iris flower are a visual treat on a Spring day, and the colorful blend of tones make it a much loved sight. The blooms of the iris flower make it a firm favorite as a gift for your loved one or family members. Our Midnight Iris bouquet is an incredibly beautiful yet mysterious looking flower arrangement. 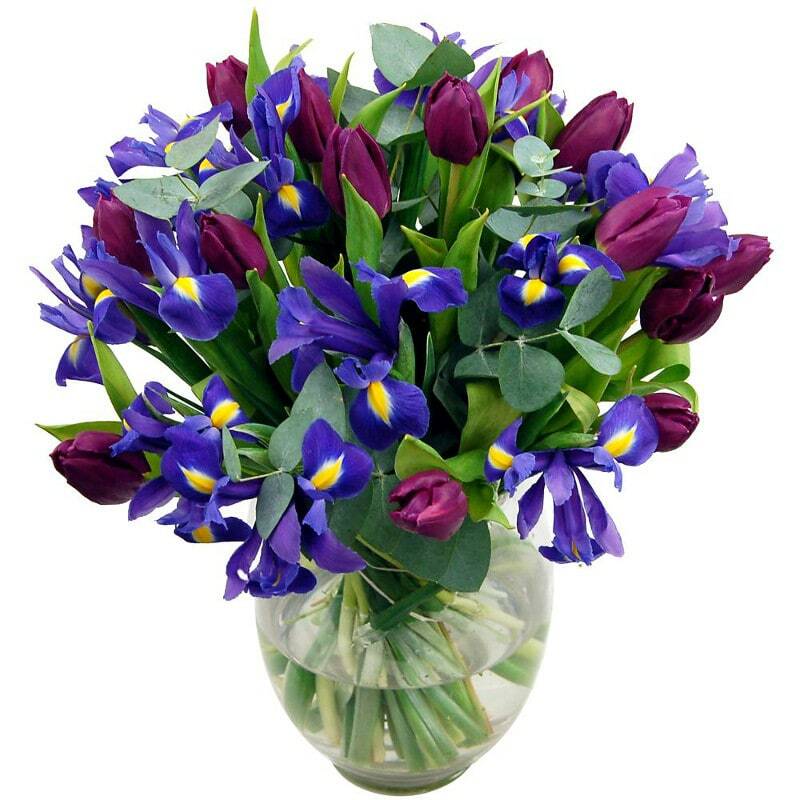 With a rich blend of blue irises surrounded by deep purple tulips, this bouquet is an alluring sight to behold. With a gorgeous scent of a summer garden, this Iris Bouquet is an ideal gift for a man, or for placing in your office for all to enjoy. 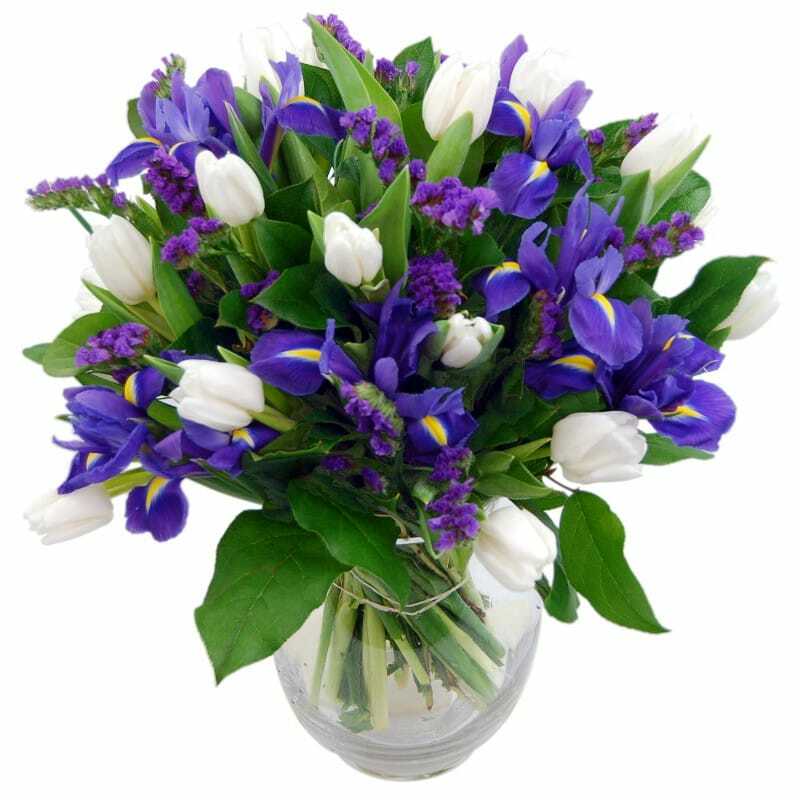 A wonderful bouquet that gives that subtle hint of Spring, our Blue Dew Bouquet is a fantastic bouquet this Iris Day. 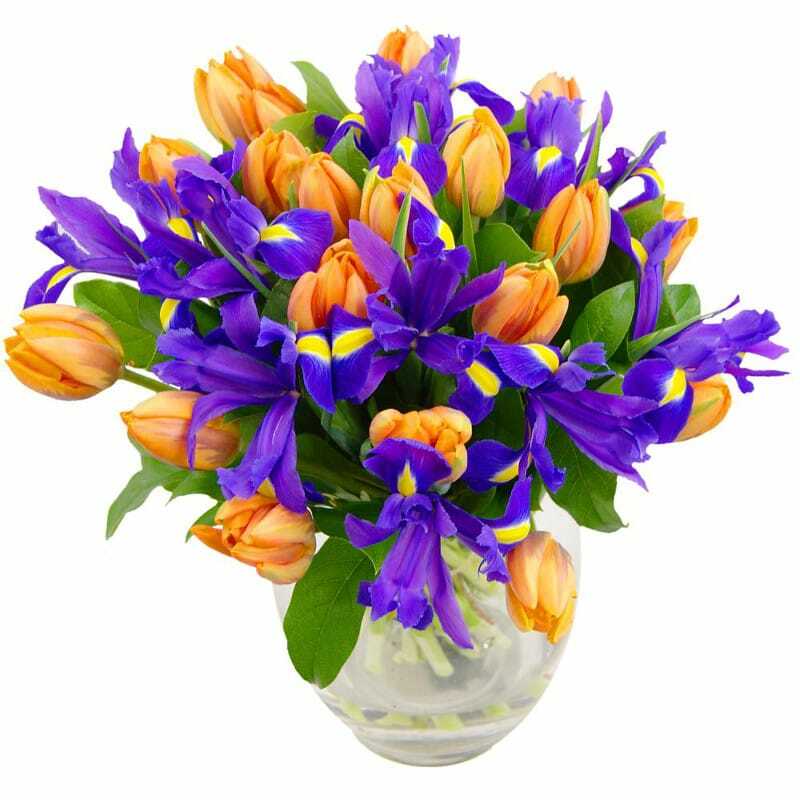 Made from a lovely combination of blue hyacinth and iris with crisp fresh tulips in between, this bouquet is carefully hand arranged and wrapped by our expert florists to ensure it arrives with you in excellent condition ready to place in a vase. Our Mandarin Blues bouquet is another popular bouquet made up of a stunning arrangements of colorful flowers to remind us of Spring. The Mandarin Blues bouquet is designed with orange tulips and dark blue iris, creating an eye-catching combination of colors. Whether you are looking to order flowers for yourself or for loved ones, our range of Iris Flowers are the perfect way to celebrate Iris Day.